Family law matters are among some of the most stressful, complicated, and emotionally challenging issues that a person can face. When you are involved in a family law issue, such as divorce or a child custody (responsibility) dispute, you need a family law attorney who understands what is at stake and can handle your case with compassion and efficiency. At Erlich Law Office, LLC, our family practice lawyer is dedicated to advising and guiding clients throughout DuPage and Cook County in connection with a wide range of family law matters, including divorce, child support, child custody (responsibility) and visitation (parenting time), spousal support, and post-decree modifications. 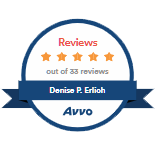 If you are going through a divorce, or dealing with other family law issues, look no further than DuPage family law attorney Denise Erlich at Erlich Law Office. Contact our office today at (630) 538-5331 to schedule a free consultation with our family law lawyer. At Erlich Law Office, we seek to resolve disputes as fairly and amicably as possible through alternative dispute resolution options, including mediation and collaborative law. 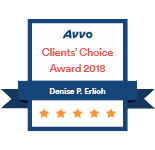 In fact, DuPage family law attorney Denise Erlich served as a certified mediator for several years and is trained in collaborative law and as a guardian ad litem. Collaborative law is an alternative to traditional divorce proceedings that focuses on civility, privacy, and long-term cooperation in an effort to avoid adversarial divorce litigation and reach a mutually-agreeable settlement. Similarly, mediation seeks to resolve divorce disputes as peacefully and fairly as possible without court involvement. Collaborative law and mediation can be particularly helpful for divorcing couples that share a number of important interests, such as parenting obligations or ongoing business relationships. Our family law attorney takes a holistic approach to legal representation, guiding clients through the entire process from start to finish, diffusing tense emotional situations, and providing practical solutions. 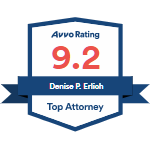 She provides comprehensive legal advice regarding the myriad legal, financial, and personal issues involved with a divorce, including property distribution, child custody (responsibility), visitation (parenting time), co-parenting, child support, paternity, spousal support and post-decree modifications. If a favorable resolution is not possible through alternative dispute resolution, however, she is prepared to aggressively fight for her clients’ rights in a court of law. Moreover, because she has first-hand, real-life experience with many of the issues her clients are facing, she is able to provide advice that is grounded in compassion and reason. Whether you are facing a divorce, involved with a child custody (responsibility) or visitation (parenting time) dispute, or dealing with other family law issues, contact Erlich Law Office at (630) 538-5331 to schedule a free consultation with our DuPage family law attorney.